THREE events coming up for Elemental Dialogues – Water on the 6th November. an interactive performance at Mottisfont NT nr Romsey. On 10th Nov in the James Turrell Skyspace at Tremenheere Sculpture Park nr Penzance, and on 9th at the End of the Road Cafe, Roselidden Farm nr Helston. For more info see individual flyers below. DANCE WORKSHOP Explore embodied interpretation of the film ‘Air’ with Gabriel Galvez through improvisation and Japanese Butoh dance techniques. Elemental Dialogues – Air is a practice-led research project that has been running for approximately 18 months. It explores what happens when the short film Air is handed over to a network of poets /writers, sound artists/musicians, and scholars, with the original soundtrack removed. Each contributor then produces an interpretation of Air, through their own diverse practice. These interpretations are then re-embedded into the film, creating new, pluridisciplinary artworks, each of which tells a different and sometimes radically unexpected story. 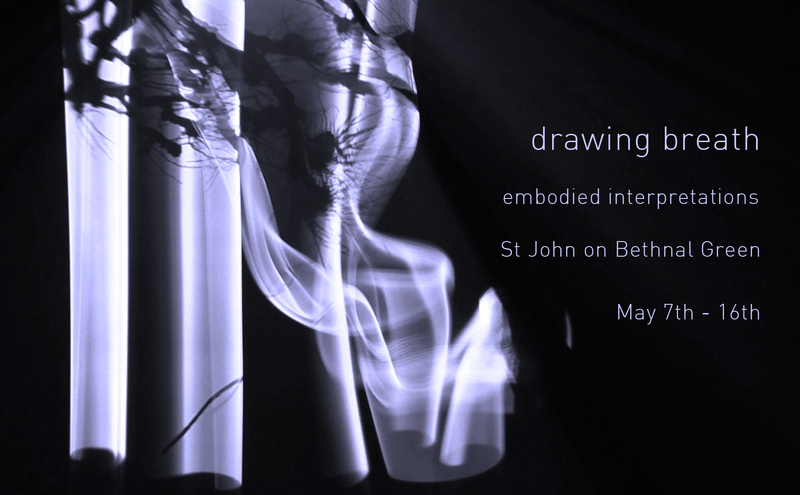 At St John’s we will explore embodied interpretations through projection, music, words, dance and tacit drawing. Poets: Joan McGavin, Briony Bennett, Steve Fowler, Marcus Slease, Owen Lowery, Tami Haaland, Kate Koning, Sara Maitland, Brian Evans-Jones. Child dancers (filmed): Jean and Iris Roffey.